The optimization industry is plagued most by a poor acronym: CRO. Here is my reasoning for changing this damaging moniker. The three letter acronym (TLA) that defines an industry or organization is crucial to its success. We all know of organizations who’ve been carried by their TLA. IBM comes immediately to mind. Here is a company that is universally recognized by its TLA. More recently, the search engine optimization industry has enjoyed significant success with the SEO TLA. Industries with poor TLAs have fared much worse. Remember the WOM industry? Neither do we. In fact the entire social media industry has fallen on hard times due in part to the lack of a compelling TLA. SMM? Please! It’s basically a mumble. Several industries have even consolidated their TLAs in an effort to get traction. Social media teamed up with local search and mobile to create Social Local Mobile, or SLM. When this didn’t work, they tried to slip a few more letters in. Hey, SoLoMo people, lower-case letters are still letters! This is really an acronym haiku. Today, the TLA for the conversion optimization industry is CRO, or Conversion Rate Optimization. This is a sad moniker for a set of disciplines that offers so much promise. The conversion rate is the number of transactions or leads generated divided by the traffic for a given period of time. It is a metric of optimization, not the thing we are optimizing. Anyone can easily increase the conversion rate of any ecommerce site by cutting all prices in half. This would bankrupt almost any business, however. Why Conversion Rate? It’s like naming our industry Bounce Rate Optimization (BRO) or Revenue Per Visit Optimization (RPVO). No, we don’t optimize conversion rates alone, so CRO is fundamentally flawed. Despite the cool allusion to a black carrion bird, it cannot stand. We can say we optimize for conversion, and could call the industry “CO”, but a quick letter count reveals that this is a two-letter acronym (TA). We spend most of our time optimizing websites, so website optimization, or WSO would work. But we have to come clean and admit that “website” is just one word, and “WO” is a TA. Furthermore, WSO is owned by the World Safety Organization, so the Association of Three Letter Acronym Selection and Transfer (ATLASt) likely wouldn’t grant it to us. We can upgrade our TAs to TLAs by adding ancillary words. Online Conversion Optimization gives us OCO. Since we’re really optimizing for revenue, we might embrace Online Revenue Optimization, or ORO. We could use the SoLoMo approach and call it OReO, but the makers of a certain sandwich cookie may take issue with this. We request that you submit your ideas for a new TLA to ATLASt. This organization is basically the ICANN of three-letter acronyms. Please note that it is an official MUO. Submit your ideas on behalf of your organization or you as an individual. It doesn’t matter to the application process. If we get enough conflict generated, ATLASt will have to do a poll to determine the proper TLA for our industry. DON’T DELAY. SUBMIT YOUR TLA TO REPLACE CRO. 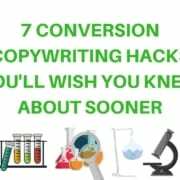 Use this in your blog posts, marketing or anywhere you want people to know that YOU DO NOT OPTIMIZE CONVERSION RATE ALONE. If You Could Ask Only One Question of Your Visitors, What Should It Be? Are Your PPC Ads Plaid and Your Landing Pages Polka Dots? I’ve been using SAC – Search and Convert. Wow. That’s has a lot of urgency, like Search and Destroy or Search and Rescue. I really like Jay Baer and his Convince and Convert slogan. I could really run with a TLA like SAC, even if its more than just straight up conversion. I like Growth Optimization – but missing the third letter. Growth Rate doesn’t make sense. Love the post Brian, and agree. We removed all references to “Conversion Rate Optimization” on our website a couple years ago (save one testimonial). And since our logo, created in 2002, is a prime TLA, I must hold tight to the stance that “Web Site” is allowed as two words! I hope we’re not too late! The only thing I want to optimize is how much revenue I can generate from the darn site. All other measures are proxies and poor ones at that! Site Revenue Optimization? SRO…hmmm…I wish my site had SRO! SRO: I like it. You should definitely get some SRO for your site. I think from a math perspective, it doesn’t matter whether the metric is dollars, visits, actions, time, or something else. It’s always some average of numerical values, hence a “rate” of X per some unit. Any reason we can’t just say we’re always optimizing a “rate”. Or MO (metric optimization) – incidentally similar to MO = Modus Operandi (as in “a criminal’s MO”, behavior). I think anything can be represented as a “rate”. Even if you’re tracking revenue, what you’re really optimizing is the rate of $ per visitor. So maybe CRO is too specific, but it’s always some sort of RO I think. Are there cases where the thing you’re optimizing is not a rate? Since testing is often a critical tool to optimization I’ve liked Testing and Optimization (T&O). If ampersands are cheating in TLAs then perhaps Web Testing and Optimiation (WTO)? You could also do TnO which is a bit of a hat tip to Omniture days of Test and Target often abbreviated TnT. “Optimization” is broadest, and I think contains the defining theme… targeted design, raising key metric for a specific purpose. But the O word is fuzzy e.g., SEO is also optimization. Our sort of optimization includes ideation, visual design, research, and testing (= data collection + analysis). Something with “O” covers a lot. But does it miss the fact that at the end of the day, most of us are collecting data and making a comparison – a specific method to optimizing. It’s more like “Optimization Through A/B Testing”. I like “A/B Testing” – it’s more granular but still fairly defining of the whole (I think MVT, split testing, etc. it’s all about comparing some A to some B). But then where does Predictive Behavioral Targeting /etc fit in… it’s optimization and it’s data collection and comparison. But it’s a multidimensional hierarchical model instead of just A/B. And it’s not “testing” per se but constantly choosing and optimizing what each visitor sees. What acronym wouldn’t get outdated when the field changes? Maybe we don’t need 1 acronym to cover all related but ultimately different fields. But then most professional acronyms are vague when you consider the full breadth of the field. For now, I prefer “A/B testing” over “optimization” and throw in “analytics” in there somewhere. Does the world need another acronym? What do you guys think? “O” is broad, but what we do is broad. In any given day, we’ll design a new mobile control, write copy, develop an image, setup a test, spreadsheet another and audit an analytics implementation. We do a lot. The world doesn’t need another acroym, but it doesn’t seem to know that. I’d say what we’re really optimizing is their experience in order to improve conversions. The conversion is just how we measure our success or failure. The better a visitors experience, the more likely they are to convert. If you really want to go in a different direction how about User experience optimization (UXO or UEO) or Visitor experience optimization (VXO or VEO). I’ve always chaffed at calling our customers and prospects “users.” I like VXO. I’ll add it to the short list. Great point! That is why I named my book ‘Website Optimization: An Hour a Day’ instead of using conversion rate optimization. The problem though I found was that too many people think that website optimization is SEO. We have trouble with SEO confusion as well. And many people are searching for CRO, so the search engines are forcing us to perpetuate the existing TLA.